Edith Head, at an appearance in Copenhagen, 1960 (B19 F5). Edith Head remains one of the most versatile and celebrated costume designers in motion picture history. Born Edith Claire Posener in San Bernardino, California, on October 28, 1897, she adopted her stepfather's name, Spare, when very young. The family spent her early years in mining towns or on Indian reservations, where her stepfather worked as a mining engineer. She graduated from Los Angeles High School and enrolled at the University of California at Berkeley, majoring in Romance languages. Upon obtaining her A.B. Degree from Berkeley, she entered graduate school at Stanford University, where she earned the degree of Master of Arts in French. Head took a position at the Bishop School for girls in La Jolla, California , where she taught French and Spanish for a semester. She then returned to Los Angeles and took a position teaching French and art with the Hollywood School for Girls. To bolster her knowledge of art, she enrolled in evening classes at Otis Art Institute and Chouniard Art School. During these studies, she met Charles Head, the brother of a Chouniard classmate, whom she married in 1923. 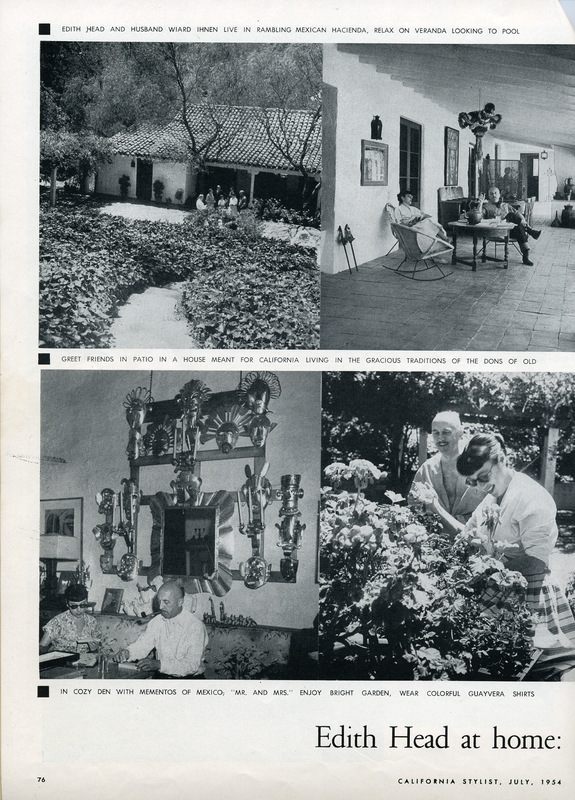 Among Head's students at the Hollywood School were the daughters of famous movie director Cecil B. DeMille. In the summer of 1924, when she tutored the DeMilles to supplement her income, she had opportunities to visit DeMille's movie sets. About these visits Head says, "I was intrigued," and by the end of that summer she had answered an ad calling for costume sketch artists. When Howard Greer, then head designer at Paramount, asked for samples of her work, she returned the following day with a portfolio of drawings borrowed from her fellow students at Chouniard. Head remembers, "Howard said he'd never seen so much talent in one portfolio. I got the job." Though her deception was easily discovered, Greer was amused and began to teach her to sketch. She spent her first months at Paramount as a sketch artist for Greer and his assistant, Travis Banton, but then graduated into the "horse opera class" where she stayed four years doing "leather chaps and one- and two- pistol skirts for rip-roaring westerns." The next move up the ladder took her to the "grandmother class," which she explains as being the class "where somebody else does the leading lady and you do the grandmothers and the aunts and anybody that's left over." She was in this class for another four years until Howard Greer retired to do free lance work, at which time she was made assistant designer under Travis Banton. When Banton resigned in 1938 to join Greer, Edith Head was named head designer at Paramount Studios, the only woman to hold such a position at that time. She remained at Paramount Studios for 44 years, although she was also lent out to work at MGM, Warner Brothers Studios, Universal, Columbia , and 20th Century-Fox. In 1967, she signed a long-term contract with Universal Studios, where she would continue to work until her death. 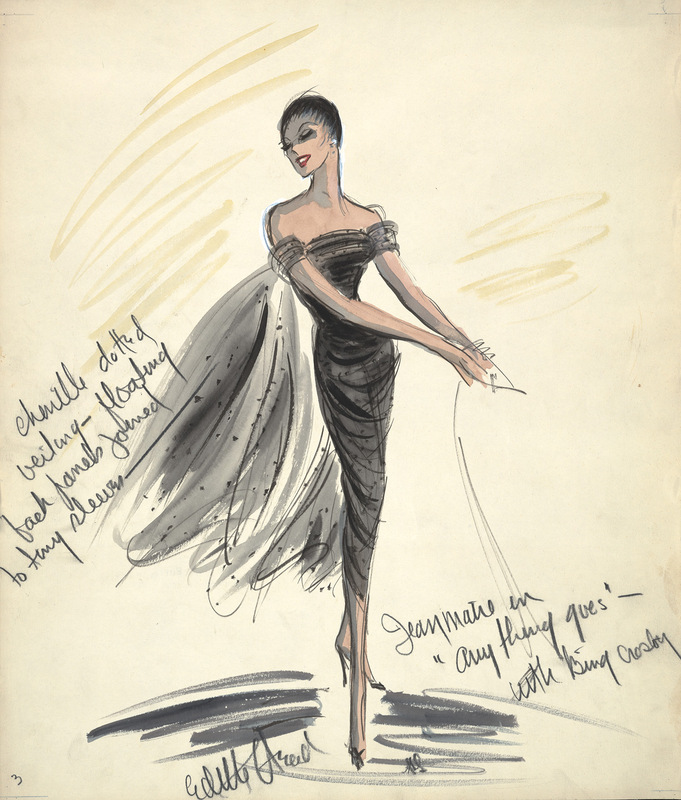 During her long career, Edith Head became one of the most-recognized figures in the industry. Her 35 Academy Award nominations and 8 wins remain records in the Costume Design category, and also represent the most nominations and wins by any woman in any category. She won Oscars for her work on the following films: The Heiress (1949); All About Eve (1950) and Samson and Delilah (1950); A Place in the Sun (1951); Roman Holiday (1953); Sabrina (1954); The Facts of Life (1960); and Stitch (1974). Head also won the Costume Designers' Guild award as the leading and most outstanding designer in the motion picture industry, and served as President of the Costume Designers' Guild. She further built a reputation as a fashion authority in American culture through her work outside of Hollywood . Head did radio work, made regular appearances on television, wrote sketches for fashion magazines and periodicals all over the world and wrote two books, one of which, The Dress Doctor (1959), was a best-seller. In the early 1960s, Head had her own radio program, Edith Head's Fashion Notes, on CBS radio. On television she appeared regularly on Art Linkletter's House Party, a role carried over from the program's radio days, and frequently on such television programs as the Mike Douglas Show, the Merv Griffin Show, Virginia Graham, and the Gypsy Rose-Lee Show. She expanded her career to work as a columnist for Newsday Specials and prepared two columns a week for leading newspapers all over the country. Following her 1938 divorce from Charles Head, she married Wiard Ihnen in 1940, a marriage which lasted until his death in 1979. Ihnen, a noted architect and motion picture set designer, won two Academy Awards himself, for the designs in Wilson and Blood on the Sun. Head died on October 24, 1981. Her last film, Dead Men Don't Wear Plaid (1982), was released posthumously and dedicated to her memory. "Edith Head: Biography". Margaret Herrick Library. Academy of Motion Picture Arts and Sciences. Edith Head Papers. Wisconsin Center for Film and Theater Research. Head, Edith, and Jane Kesner Ardmore. The Dress Doctor . Boston : Boston , Little, Brown; 1959. Head, Edith, and Paddy Calistro. Edith Head's Hollywood. New York , NY : E.P. Dutton, Inc; 1983.